San Lorenzo, CA — A heartening trend is growing on social media showing that people are waking up to the state persecuting individuals over victimless crimes. 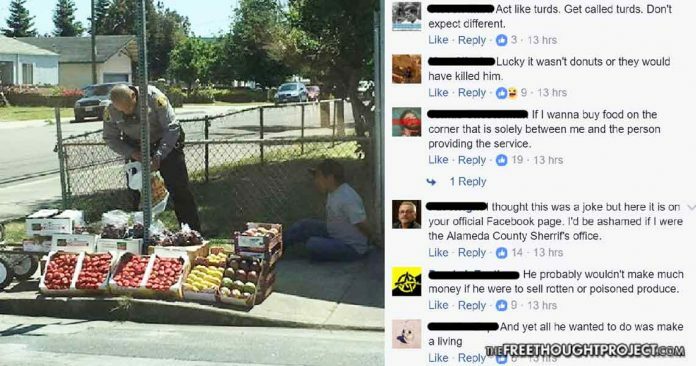 The latest example of this trend comes from the Alameda County Sheriff’s department posting a photo of a deputy arresting a man for selling fruits and vegetables on the roadside and attempting to justify it. When people read the department’s justification, they lashed out — peacefully — to let them know what they were doing is wrong. Here is a screen grab of the post below in case it is removed. It contains one of the most epic comments on the entire post. However, nothing in this photo was deceptive and the sheriff’s department statement even confirmed it. “Our deputy approached this man to advise him that it was illegal for him to sell produce on the corner. When the deputy asked the man for his identification he became resistive and tried to flee. Our intention here was not to arrest him or get in a confrontation with him. We learned, the man is on federal probation and is expected to follow all laws. This is likely the reason he tried to flee,” the sheriff’s department wrote. The department attempted to justify kidnapping and caging this man because he tried to flee the officer who wanted to kidnap and cage him for selling fruits and vegetables. People saw right through it and hundreds of them went on to let the sheriff know how they feel. “Justify however you want, if a deed doesn’t have an identified victim, it’s not a crime and you become the criminal. Badges don’t grant privileges of immorality,” one Facebook user wrote. This poor man had likely been arrested for selling vegetables on the street before which is most likely why he ran. By saying the man ran from a kidnapper as a means of justification for kidnapping him is hardly a good point — which is why this dug the department an even deeper hole. While there was no shortage of comments chastising the department for this victimless crime enforcement, sadly enough there were a few scattered comments by champions of the police state interjecting their ridiculous justification as well. One Facebook user went so far as to somehow apply the two party paradigm to this situation. The comment above illustrates the sheer ignorance which has led to society accepting the enforcement of laws for victimless crimes. The poor uninformed individual who thinks standing up for people’s rights to do as they please without causing harm to their fellow human is ‘liberal’ is sadly just a cog in the wheel that is the police state. Standing against big government reaching into every aspect of our lives with permits, licenses, and fees — is the antithesis of the leftist. Luckily, commenters like him were few and far between. For the most part, the nearly 2,000 comments were all from people awake to the police state. “Legality doesn’t equate to morality. If there’s no victim there’s no crime and until you stop using violence and extortion against peaceful people everyone’s going to hate you,” one person wrote, summing up the problem of policing in America perfectly. The bottom line is — in modern day police state, USA — exchanging goods and services is a crime unless the state gets their cut. We are told that this is for our safety and that we could all die if a brown man sells tainted strawberries on the corner. But nothing could be further from the truth. “Persistent street vending harms local businesses, especially small, start-up food vendors and poses certain health risks such as Ecoli and other food borne illnesses,” writes the sheriff’s department. E coli is certainly something to worry about, however, it is not nearly as deadly as the police. In fact, police kill 30 to 40 times more people every year than e coli. Also, the overwhelming majority of e coli outbreaks and other foodborne illnesses come from factory farms and corporations whose representatives and owners are never prosecuted for the deaths related to their products. Ah, but sell some strawberries on a street corner, and you are an enemy of the state who deserves to be kidnapped and caged. Thanks for not buying it Facebook users.